Microsoft has finally decided to close the Windows Live Messenger service on March 15th 2013. From that date onwards, users will no longer be able to use it and will have to switch to Skype. 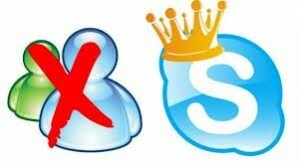 The company, according to the BBC, sent an e-mail to service users, encouraging them to become familiar with Skype, which Microsoft acquired in October 2011, prior to shut down date. Last November, the company had already made known its intention to stop the service Windows Live Messenger, without specifying an exact date.